Check out the History For Sale link for DVDs, Xmas decorations, cards and Frig magnets. E. Deer Hunting has never been illegal in VT. I resolve to get these newsletters out earlier. I resolve not to hoist Pat Farmer to the top of Pratt Hall after the month of September. I resolve to stop sending out membership solicitations. Okay... I'll work on the jokes... One out of five ain't bad, right? Thanks for your continued support. The Montgomery Historical Society received three awards at the joint annual meeting of the Vermont Museum and Gallery Alliance, and Vermont League of Local Historical Societies on November 2nd in Middlebury. Two were in recognition of excellence for Individual Contributions and one was for excellence in Society Operations. Bill Branthoover was recognized for Lifetime Achievement. 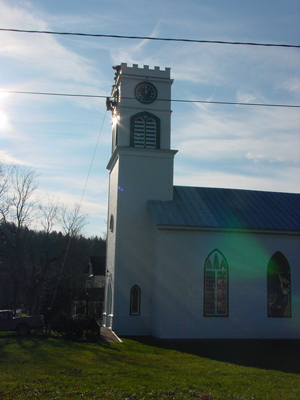 He was one of 34 persons who founded the Society in 1974 around the cause of saving the former Episcopal Church, built in 1835. It was restored over the next 23 years and during this period Bill served in many leadership roles including over 10 years as President. Bill also researched and authored many documents, books and articles and was also the Society's archivist for over 20 years. Marijke Dollois was recognized for Individual Achievement for her work as Society Membership Chair, a position she's served in for 20 years. Since 2003 her program increased membership by over 40% and membership and program revenues as well. The Society exceeded 200 memberships for the first time in 2007. The Society's efforts to use the power of the internet were singled out with an award for excellence in Society Operations. In this category the Society's web site, electronic newsletter, and email outreach were all cited for improving communications with its membership and the community. We are thrilled for Bill and Marijke, the recognition is well deserved. These awards also reflect the cumulative efforts of past Officers and Board Members and many other community members and businesses that have supported us over the years. We are very grateful for their support. Our annual community sign along was great fun. The Hall looked beautiful and we all sang above average. Thanks to Noella McGroarty, Marijke Dollois, Parma Jewett, Kay Maynard, Lisa Perry, Suzanne Dollois, Kathleen McCloskey-Scott, and Andrew Massey. a. "This Day in History" new every day. b. A "new" history of Pratt Hall written in 1934 to commemorate the Episcopal Church's 60th anniversary. It also includes a picture from that period. c. Montgomery's Memorial Day Compendium, authored by Bill Branthoover and including a list of Montgomery Veterans, the wars they served in, and where they are buried. We'll be adding more information over time. Please let us know if you have any suggestions. Thanks. This year's theme is "Industry and Innovation: Vermont Ingenuity." The Board decided to mount an exhibit featuring Montgomery's timber heritage focusing on Montgomery's Atlas Plywood Company's three ply shipping container fabrication. Thanks to a vintage catalogue recently donated by Rita Tatro we will have some photo's for the exhibit but would be interested if anyone has any memorabilia or items we could borrow for the exhibit, or recollections of the plant we could document. Please let us know if you have any ideas at all. Thanks. The following is a summary of the assessment we recently received from Architect Michael Gohl. It was was co-sponsored by a grant from Vermont Historic Preservation. It will form the basis for developing a plan for future work and additional grant writing. The entire report will be posted to our web site soon. Please note the reference to "missing and broken panes" of glass is not to the stained glass windows, but the older clear glass storm windows exterior to the stained glass windows. "The current condition of the building is good, with certain exceptions. The exceptions are several deteriorated window casings, missing and broken window panes, siding and wood trim too close to the ground, inappropriate foundation repair, deteriorated vestibule floor joists, structurally compromised bell tower, undersized basement post footings, undersized stage floor joists, decayed attic top plate, and several noticeable wall cracks. The basement and crawl space floors are dirt, the furnace and nearby fuel oil tank are relatively new, and stored materials are located within close proximity to the furnace. Building insulation is substandard. If the intent is to use the building in colder weather, a winter thermal scan might be considered to determine the extent of the thermal envelope." Since the last newsletter we successfully removed the remains of the rotted hands from the front face of the tower clock, fabricated new ones, and installed them. The effort, which I christened MHS Junior Birdmen, was led by Pat Farmer who did all the rigging, and put his life in the hands of volunteer line (rope) handlers Andre Gareau, John Beaty, Ken Secor, Bill McGroarty, Charlie Fichman, and Mark Baddorf. c. In one hundred and fifty years Vermont's landscape changed from a dense forest to seventy percent pastureland. Environmental changes were evident by the decrease in animal populations by the mid-1800s. Catamounts and wolves disappeared as their natural habitats were destroyed. Deer herds were so depleted that hunting them was illegal from 1865 to 1897. Eroding soil filled streams and fish populations declined. Flooding was becoming more and more of a problem. Vermont's already marginal soils were being washed away. Source: VHS On line exhibit “Freedom and Unity”. The Montgomery Historical Society Board is... Scott Perry, Bill Branthoover, Marijke Dollois, Sue Wilson, Bill McGroarty, Parma Jewett, Sally Newton, John Beaty, Jo Anne Bennett, and Pat Farmer. Our final number of memberships for 2007 is a record 222 which raised just over $10,500.00. Thank you all for joining or renewing. We couldn't do what we do without your support. We will begin our next membership drive in March, and as Marijke says, now the pressure's on for us to meet or exceed our newly set standard.